Bitport.io is a cloud torrent service from Czech Republic that allows you to download all the files straight to the cloud and not your device. As a result, you do not need to install any type of software for completing the download. Due to its online status, you can rest assured that all the files are perfectly synced and you can enjoy them wherever you are. So this cloud service has nothing to do with cloud mining services from companies like hashflare.io – we dont know why we get asked this again and again. The service is easy and simple, as you will get to see in this Bitport review. When you visit Bitport.io, you will be encouraged to register for free and create a new account. 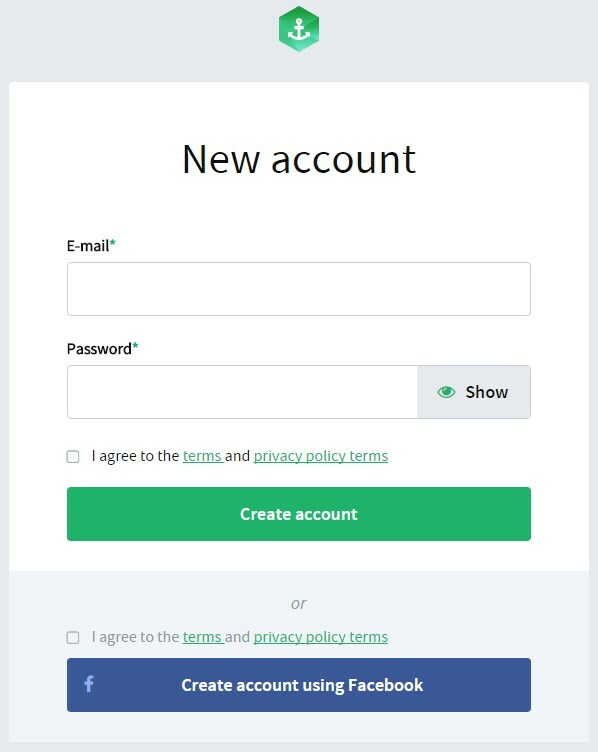 You only need a valid email and a password to complete the sign up process and there is the alternative of using your Facebook account for the same purpose. You must click on the specific button that verifies you agree with the terms of the site, so you had better check them out beforehand. As soon as you have completed the sign up procedure, you will be redirected to the options you get from the account. You can either choose the free plan or the premium one, according to your specialized needs. Of course, there are differences as to the features you can enjoy and other stuff that will be covered below in detail. Even the premium plans are not identical – instead, there are three premium options for you to select from. As mentioned above, there is the option for you to try out the free plan or go ahead with one of the premium plans. With the free version of Bitport.io, you can get up to 1GB cloud storage and only one slot for download. Of course, it makes total sense why you cannot get the maximum performance the service for free. There is another limitation applied as to the overall torrent downloads permitted per day. This is only one and hence you ought to think twice about how to use the service. On the bright side, the service will work online on all devices. Premium plans vary from small to standard and then big. The Small plan offers up to 30GB cloud storage and five slots. Unlimited torrent speed and number of downloads per day make this a more convenient and flexible option. It is available from $5 per month. 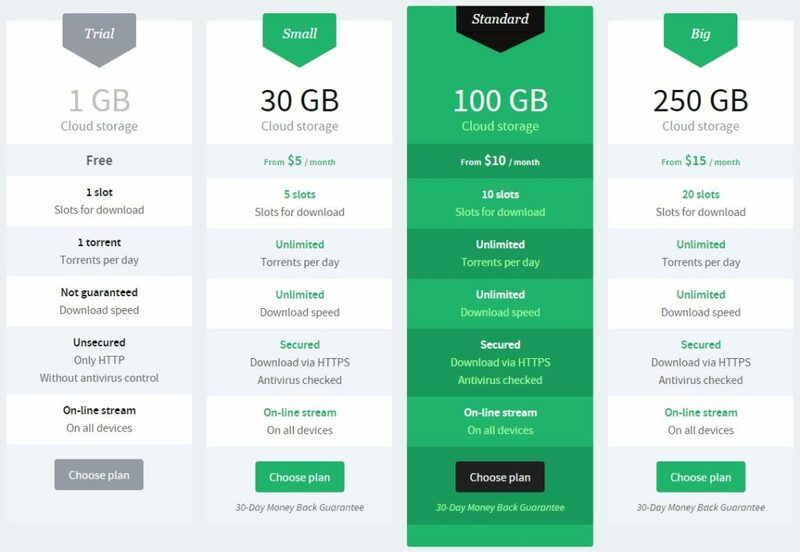 Standard provides cloud storage of up to 100GB and of course all the merits of the Small plan. Ten slots are available for download and the price rates start at $10 per month. Last but not least, the Big plan provides up to 250GB cloud storage and twenty slots for download. It also offers unlimited torrents per day and unlimited download speed, secured download via HTTPS and antivirus check, as well as online stream on all devices. All the plans come with a 30-day full money refund guarantee. This is great, as you can test drive the service and see if it fits your own needs and desires. What is more, payment methods are quite flexible. You can use all credit and debit cards, PayPal and Bitcoin, as much as over 50 more payment options for you to benefit from. 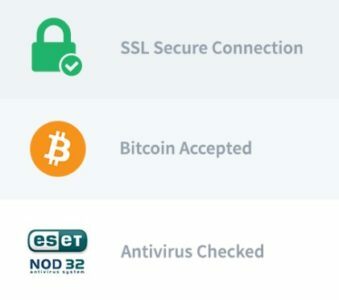 Payments are SSL secured, which is another asset of the service. To stay totally anonymous, choose Bitcoin as a payment method. You can find good bitcoin exchanges on this website to exchange your US Dollar or Euro to Bitcoin. From the dashboard you can choose to download torrents in two distinctive ways. First, you can use to copy and paste the URL link of the torrent. Otherwise, you can upload the torrent from a PC. As soon as you have completed this simple procedure, you need to state where you want the files to be uploaded for use (in which folder that is). It is cool that you can check the progress of the procedure at all times and see how it goes. It is essential to verify, though, that the uploading process has been completed successfully and that the file has instantly begun to be shared on the cloud. When you want to have a look at your files, you can simply click on the respective button from the dashboard. This will open some folders for you – by default you will see Movies, Music, Photos and TV Shows. You can download them as per your request and preferences from this section. The link of each file can be copied and pasted on the streaming service of your liking. In this way, you can enjoy movies and videos etc. in no time and with absolute convenience. Throughout this Bitport.io review, everything on the site ran smoothly. There were no delays and the uploading process was over before even noticing it. As for download speeds, they were also blazing-fast. Imagine that you can download a whole movie in HD in less than half an hour and you will get an idea of what to expect. There are multiple portals as to how you can reach the representatives of Bitport.io, although there is no 24/7 live chat that would be great. You can contact them via form submission and expect to receive feedback without any delay. They are firm and straightforward when it comes to satisfying the requests of their clients, so you need not worry. Apart from that, you can check out the informative FAQ section of Bitport. There you can see a lot of the unanswered questions that you have been repeating inside your mind all this time. So feel free to navigate through the answers to inform you about the service. Finally, there is active presence of Bitport on Facebook and Twitter and this can prove useful in case of an emergency. Social media power should not be underestimated, after all. Bitport.io review has been truly enlightening in terms of quality and efficiency, value for money and special features offered. This cloud-torrenting service is able to cover the gap that has been left, when it comes to cloud storage and torrents. Without the need to install any software, this is a great service that enables you to upload and download, share and enjoy any content online. The cloud is a wonderful asset in the digital world without a doubt. Even though some extra features would be welcome, this is a useful and versatile service for torrent fans everywhere.